It’s great for packing in kids’ lunches with baked tortilla chips or pita wedges, or for serving at parties when you’re in a time crunch. If you like to make your own hummus, you can do that too; it’ll just take a bit longer, but the results will be just as tasty. And if you want to keep it perfectly green for a few days (although I’m not sure you’ll be able to resist eating it all in one sitting) you can check out my tutorial on how to keep guacamole fresh and green with a great tip that applies for this dish as well if you plan to store it in the refrigerator for more than a day. A simple, healthy snack that both adults and kids will love. Vegetarian and vegan-friendly and gluten-free, too! In a food processor (such as the Cuisinart mini prep), blend 1 cup of hummus with 1 medium Hass avocado and the juice of one lime. Use a spatula to remove the mixture from the food processor's cup. Serve with hearty tortilla chips. Have you tried guacahummus? 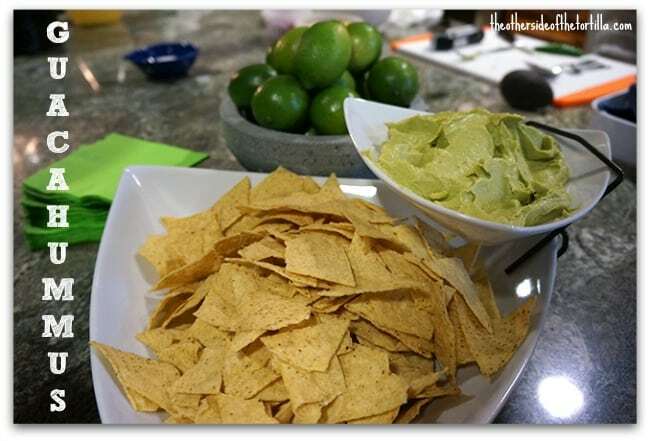 Do you have another easy, healthy Mexican snack to share? Let me know in the comments! This post includes affiliate links to my Amazon aStore, El Mercadito, recommending products that I used to make this recipe. I used a Cuisinart 3-Cup Mini Food Processor to blend my guacahummus. 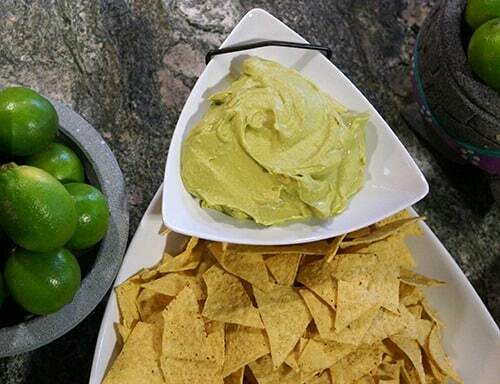 Thank you to Pattie Cordova at Living Mi Vida Loca for sharing her photos of the guacahummus I served at my party.